This meal was an accidental group effort on the charcoal grill. 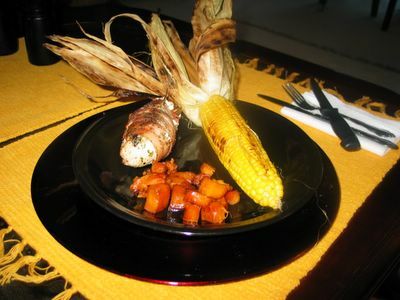 We already had two ears of yellow corn and one large sweet potato that I had purchased earlier last week. Last Thursday afternoon Pat sent me to the grocery store with a demand for some items including boneless skinless chicken breasts if they could be had for less than $10 each. Any way, I arrived home with the chicken and the inevitable extra impulse items that I always buy like spices and such, and the next task was to decide how to cook the chicken. We eat so much of it (chicken), we’re finding it (chicken) to be a little B-O-R-I-N-G.
We soaked the ears of corn with the husks on in a big boiler, and Pat pealed and diced the sweet potato into ¾” cubes, and placed it in a double thickness aluminum foil pack with some brown sugar, butter, and a little olive oil. Soak your ears of corn in water for a while, then drain them and wrap them tightly in aluminum foil. Throw them on the grill. In a small mixing bowl, combine your cream cheese, tarragon, pepper, scallion, and truffle oil and mix well. Meanwhile, while your potatoes and ears of corn are cooking on the grill, rinse off your chicken breasts and pat them dry on your cutting board. Take a sharp paring knife and slice into the fat side of the breast horizontally to form a nice deep pocket in which to place your cream cheese mixture. Try not to cut all the way through the breast except on one side. Now spoon your cream cheese mixture into the pocket in the breast and pinch everything tightly closed around it. The cheese mixture will act sort of like glue and hold it closed. Take two slices of bacon and wrap the whole thing up, and pin the bacon tightly around the breast with two or three toothpicks. After the corn and potatoes have been on the grill for twenty or twenty five minutes, place your chicken on the grill and let everybody get to know each other. Be sure that you make proper introductions –I hate cooking and eating with total strangers. Let the chicken cook for about 10 to 12 minutes, then turn it over and give it another 10 minutes or so. Medium or medium/high heat I suppose, eh? Did you get any problems with the cream cheese running and burning on the grill? Looks damn good ... glad you do photos for your recipes, too. Gives that extra gratificationahhhh ... excuse me, I have to wipe down my screen now. When I had a contract in Dallas they made a dish like this where they added a piece of jalapeno with the cream cheese and then served it with a tomato and basil salad. Excellent.